Construction mediation is evolving today as an effective way to resolve disputes between members of the construction community. The increasing importance of the technique of mediation and alternative dispute resolution can also be noted in changes in the Court Rules of procedure, which actively encourages the use of such methods. The increasing importance of alternative dispute resolution is due to its myriad benefits; i.e. its been proven to be highly effective, it is voluntary and requires the full consent of all parties involved, unlike legal procedures, it is not lengthy and does not involve as many protocols. As a result of these factors, it is quick and very economical and more creative ways can be used to solve problems. Mediation is a consensual process where a third neutral party helps disputing parties resolves their dispute by working toward and achieving a mutually satisfactory solution. Any member of the construction community involved in the dispute can initiate mediations. 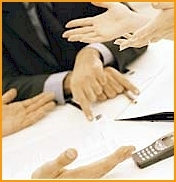 The mediator is invited by the parties to resolve the case through mediation sessions. As in all mediation cases, participation is voluntary and any party or the mediator can terminate the mediation at will at any given point of time. A mediation agreement is first designed setting the ground rules and the basic points of the case are given to the mediator in writing before the case begins. Proceedings begin with an elucidation of set ground rules for the case and then each party presents its side of the story. The teams are not supposed to interrupt while the other team presents its case. The mediator on the other hand can ask questions whenever he wants to understand the case fully. The mediator, unlike an arbitrator or judge, has no power over the participants. Thus he or she must require good persuasion and negotiation skills. Choose a person who has absolute objectivity and construction expertise. Expertise in the subject matter goes a long way in allowing the mediator to foster compromise between the parties, a role critical to success in the majority of construction mediations.